St. Lucia is home to the majestic Piton Mountains, the twin volcanic peaks rising thousands of feet above the island. Sightseeing tours offer a look of the island's rugged beauty, including the tropical rain forests. Most also visit Le Soufriere, the world's only drive-in volcano. 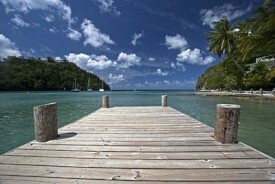 Water lovers will find a variety of water sports at Marigot Bay.